When it was announced that the classic science fiction novel “Ender’s Game” was finally being made into a movie, fans that had waited decades to see it on the big screen had some questions. But the real question on all “Ender” fans mind was and still is: what does the Battle Room – the zero-gravity training ground where recruits learn to fight alien invaders – look like? Well, here’s an exclusive first glimpse of the iconic set piece in the “Ender’s Game” teaser poster reveal. In the poster you see the figure of Ender from behind. He’s decked out in his full spacesuit with his laser pistol at his side (his helmet has a dragon insignia for his team, “Dragon Army”). At his feet is the message, “Warning: Null G Beyond This Point,” meaning there will be no gravity once he steps into the Battle Room. Inside you see his fellow competitors blasting at each other, with most grabbing onto the immobile “stars” (the blocks with the triangles on them) for support. And the transparent walls of the room give you a view of the Earth as the Battle School orbits above. One deviation from the book is that in the original text the Battle Room is described as being a giant hollow cube. But Hood felt that to really convey the size and dimensionality of the space, it should be spherical. Hood said he then proposed, “What if we could see through? What if we could see out of the space, and we’re moving around the Earth and turning at the same time?” He said he felt that would create “a really strange, disorienting experience,” that would better capture the notion in the book that in space there really is no up or down. Hood also revealed that in order to get his young actors ready for the experience of recreating a zero-G environment, they went to the actual Space Camp in Hunstville, Alabama. They were submerged in a giant water tank – much like the one real astronauts use – to approximate a gravity free environment. They also trained in wirework to learn how to act while dangling from a harness. And they underwent full body scans so their features could be mapped onto digital doubles. 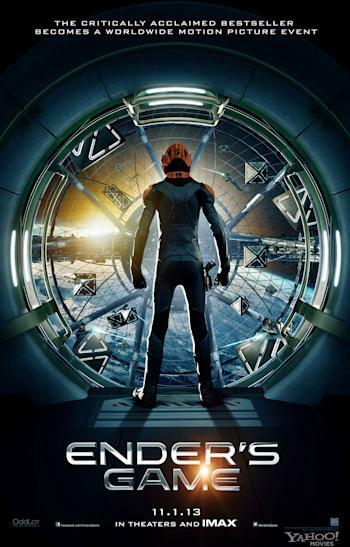 Ultimately, this poster gives just a hint at the future world of “Ender’s Game,” and there should be much more to see before the movie finally hits theaters on November 1.